Now that Christmas is over, its finally safe to me to reveal to the world at large what I made this year for gifts. As I’m a logical creature, I’m going to present them in the order in which I completed them. I had to keep photos and information offline while making these items as I didn’t want to spoil the surprise for those who I was gifting. I don’t have photos of each person wearing the items I made, but I will get them eventually – so I have substituted a dummy model or a chair instead. Other: did only 8 repeats of the pattern as Mary wanted something closer to her neck for warmth. And it only took me two days to make this, huzzah! I made a pair of fingerless mitts to match the cowl (you can sort of see one in the photo above) as I still had 90 yards of the yarn left over and I thought it might be nice for her to have a set. Other: only took me 3 days to knit these mitts! Had to learn a new knitting technique call the Vikkel Braid which is from Estonia. Took me a few tries to figure it out, but its really rather cool. 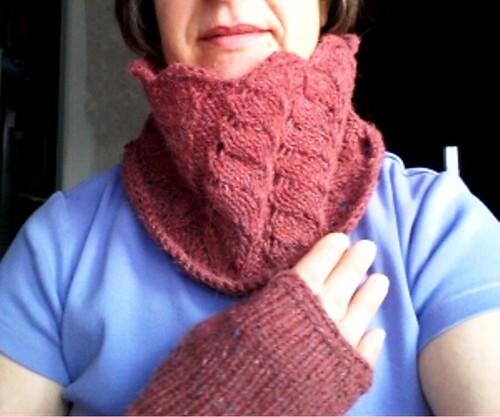 Funny thing about this gift, my b-mom had no idea that I made her matching fingerless mitts to go with her cowl. Only a day or two before Christmas, she was telling me how cold her workplace was, and how she wished that she had some fingerless mitts to keep her warm on the job. Talk about psychic! Yarn: Berroco blackstone tweed (no idea yardage as I forgot to weigh it after the fact) in Ancient Mariner, and Universal Yarn Deluxe Worsted Instant Print (try to say that 5 times fast!) in forest tones (again, no idea about yardage, but it was minimal as this yarn was used for the self-striping portion of the hat). Other: this hat also only took me 2 days to knit. Efficient? You bet! And now for something completely different – a woven project. 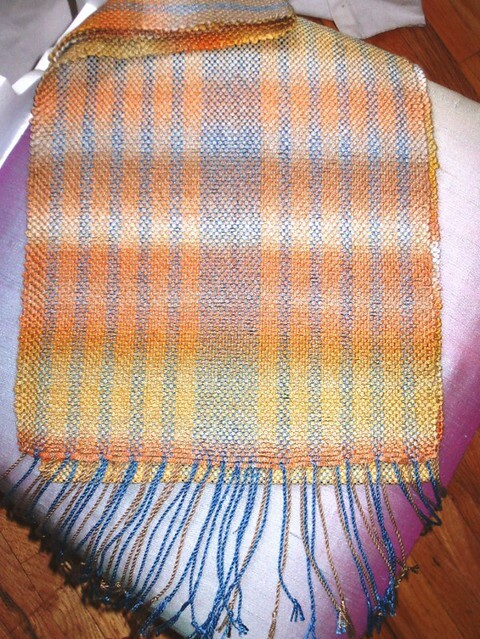 I posted about this scarf that I was weaving for D’s mum for Christmas, and now I have something to show for it! It sure is purdy, eh? It sure took me a long time to weave as the yarn weft was all lace (or cobweb) weight. Probably some of my finest weaving work to date. I didn’t have a pattern per se, I just warped the loom in a way that I thought would showcase the variegation in the weft yarn. I have no idea how much yarn I used up, as I was busy trying to get this thing done in time for Christmas. Warp: 7′ long and 14″ across a 10 dpi (dents per inch) reed. I alternated 3 double shots of tan coloured rayon yarn with 2 double shots of blue Sweet Georgia Seasilk yarn except for where I pooled the blue yarn in the middle of the warp. Weft: variegated nylon/cotton ribbon yarn that moved through a muted rainbow colourway. Other: I hand-twisted all the ends to have a more finished product. Patti loved it, and I can’t wait to see a photo of her wearing it! 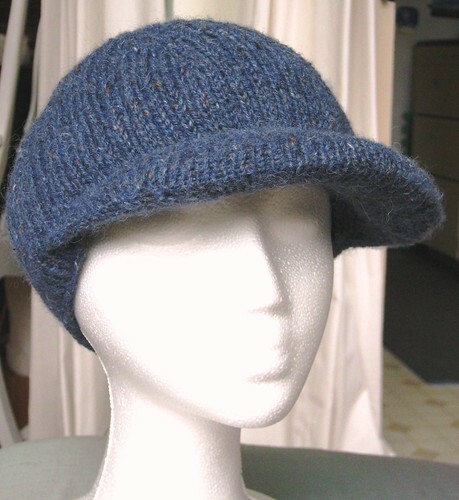 Secondly, I had to knit a casing for the visor (which included learning how to, finally, do Judy’s Magic Cast-On for an invisible starting edge – cool stuff I tell ya). 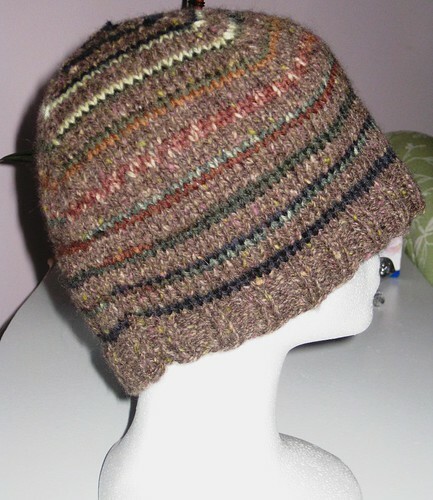 Then I had to knit the visor casing closed. This was a challenge and required as many size 3mm dpns that I had laying around. 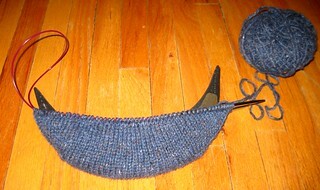 But the real challenge was yet to come – knitting the visor onto the body of the hat. I needed a lot of patience and deep breathing to get through this part. I couldn’t put the knitting down to take a photo, but as I have a completed picture, you can take my word that I survived this process. It did hurt my hands though; and needless to say, I took a break after all this holiday gift knitting. Yarn: Classic Elite Yarns Portland Tweed in Hudson Bay colour; 211 yards used. Needles: 3mm dpns for the band, 3.5mm 16″ circular needs for main construction, and 4mm 24″ circular needles for the brim casing. Other: I did 7 short rows on the band to give it a more finished look. I’m very pleased to say that Ron loves his hat and has been wearing it everyday to walk the dog. This makes me happy knowing that I gave him a gift he could really love and use. 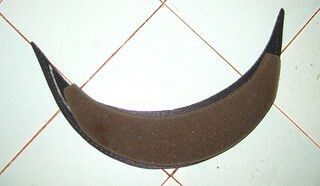 WRT, Dressew carrying hat visors: I was very disappointed that I also couldn’t find foam for slipper soles last year. The woven scarf is a thing of beauty. You are currently reading Christmas projects recap at When Gaia Smiles.